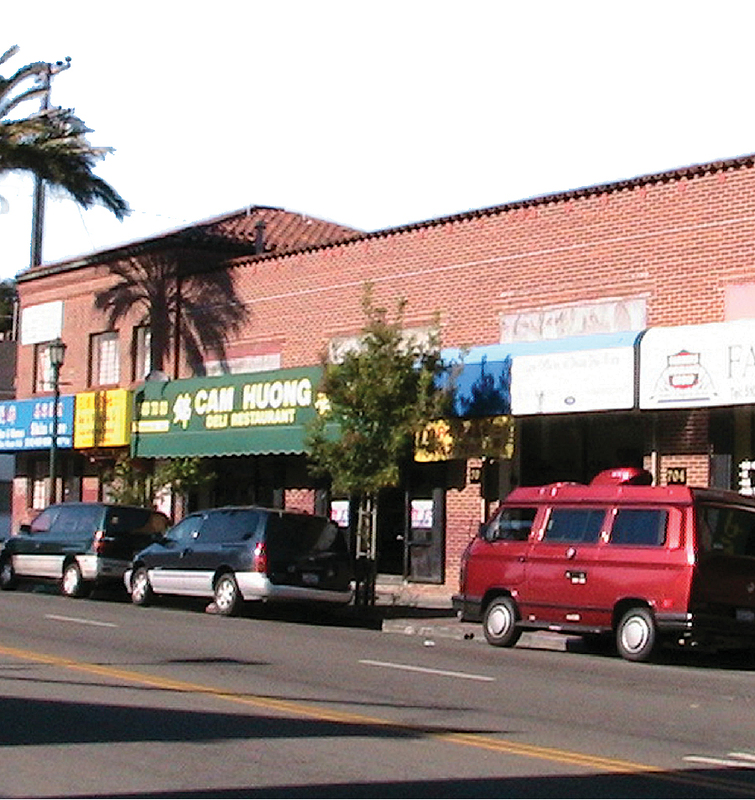 The Eastlake neighborhood in Oakland, California, was selected for its mix of building types and ethnically and economically diverse population. The neighborhood had one building with an existing intensive green roof and five buildings with rooftop solar water heaters. Bay Localize, located in Oakland, California, sees urban rooftops as a potential source of food, water, and energy that will make cities more resilient and sustainable. That is the goal of its Rooftops Resources Project. An Oakland-based nonprofit organization, Bay Localize actively engages Bay Area communities, fostering partnerships and working with numerous cities and agencies in building equitable, resilient communities by confronting the challenges of climate instability, rising energy costs, and recession by equipping local leaders with flexible tools, models, and policies. Bay Localize contacted the Berkeley, California, office of PlaceWorks (formerly Design, Community & Environment) for help in developing a methodology for assessing the capacity of urban rooftops for growing food, capturing rainwater, and generating clean, renewable energy. PlaceWorks is a private planning and design consultancy with offices throughout California, working with public, private, and nonprofit clients. PlaceWorks has a robust GIS practice and is an Esri Silver Tier partner. PlaceWorks used ArcGIS for Desktop to develop an interactive research, analysis, and planning tool that assesses rooftop resource opportunities. The PlaceWorks model assesses urban rooftops as locations for green roofs that can host hydroponic gardens and photovoltaic panels and enable rainwater harvesting. This model estimates the area that can be dedicated to each use, as well as the water, energy, and food that could be produced. The methodology also identifies the potential for multiple uses on a single rooftop. The ArcGIS-based methodology developed by PlaceWorks includes several modules. The first step was a visual analysis of all buildings in the project area using aerial photographic data for automatic detection of buildings and rooftops with ArcMap, the Esri World Imagery basemap, and Google Maps Street View. Each building’s roof shape was identified (e.g., flat, gabled, sloped). The aspect of all sloped roofs was noted, and the Solar Radiation tool in the ArcGIS Spatial Analyst extension was used to assess the available solar gain. Next, a library of data layers was created showing building use, construction type, roof access, roofing material, structural integrity, and the available yard space for accommodating water cisterns. These attributes were assessed in the field by trained volunteers or staff and entered using handheld devices. Prototypes were assigned to buildings based on three criteria: roof-loading capacity, roof material, and building code access requirements. 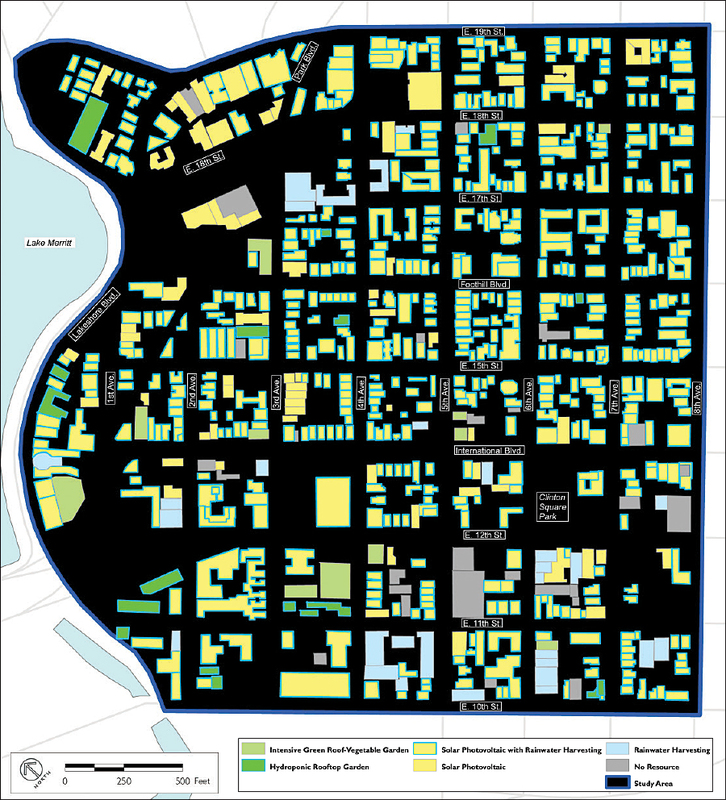 PlaceWorks runs a specialized GIS model built with ModelBuilder in ArcMap that leverages a set of algorithms to correlate the solar gain characteristics against the building and site characteristics of each building to classify its rooftop’s potential. Once classified, the structural loading capacity of each building is factored in to identify new uses that would be appropriate for that rooftop. Once these rooftops are identified, a second model quantifies the water, energy, and food outputs that could be expected. The ArcGIS Spatial Analyst extension is used to directly calculate gallons of water, kilowatt hours of electricity, and pounds of vegetables that could be produced on each rooftop. There are four key factors—roof type, roof access, weight, space for cisterns—that limit rooftop potential and are reflected in the model’s methodology. Roof type—Pitched roofs generally preclude food production though they still allow for rainwater harvesting and electrical generation (provided they have an appropriate aspect). Roof access—Developing intensive green roofs and/or hydroponics to grow and harvest produce requires stair or elevator access. Weight—Most rooftops cannot support the loading of a green roof to grow produce or even herbs. Hydroponics, however, has a lower weight coefficient and can be accommodated on many more roofs. Space for cisterns—Rainwater harvesting can only occur where adequate yard space is available to accommodate a cistern. The model assumes rainwater harvesting is possible only if a location can accommodate a 1,000-gallon cistern. Working with Bay Localize, PlaceWorks tested this methodology in the Eastlake neighborhood in Oakland. This neighborhood contains a diverse mix of building types and an ethnically and economically diverse population of about 7,000 people. 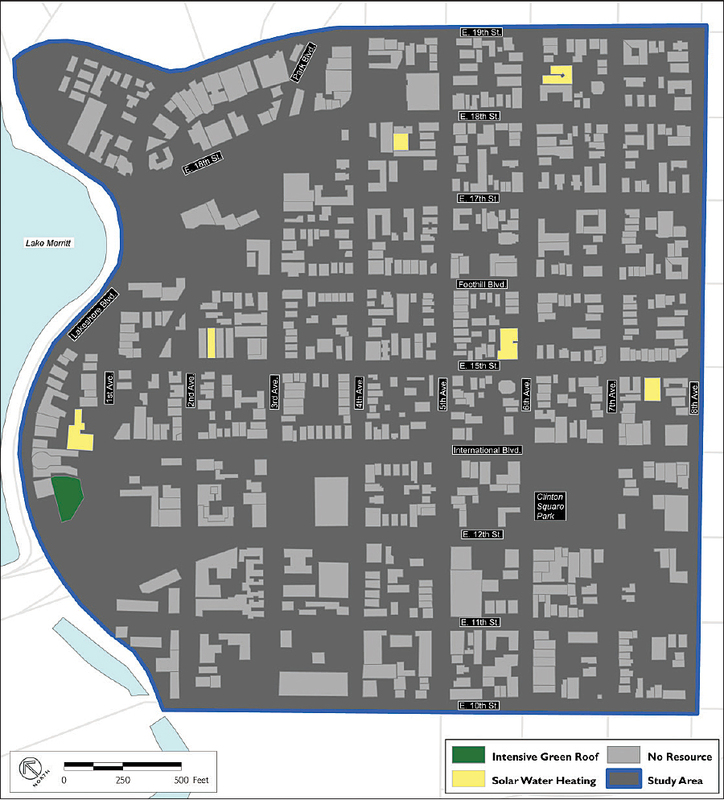 The neighborhood, approximately one square mile, has a total of 748 buildings. Flat-roofed building types varied in design and use and included retail shops, apartment buildings, and big-box retail locations. 1.9 million gallons of irrigation water/year from rainwater harvesting that could supply the outdoor irrigation needs of about 212 households. 11.6 million kilowatt-hours (kWh) per year of solar produced electricity with 8.5 megawatts of capacity [measure of the system operating at full capacity], which could supply approximately 25 percent of the energy demand of the area. 124 metric tons of leafy green and deep yellow vegetables annually from rooftop gardens. This produce could supply the US Department of Agriculture’s recommended intake of these vegetables for about 8,500 people, which is more than the number of people who live in this neighborhood. For this analysis of rooftop resources, ArcGIS is a robust tool for data management, mapping, and analysis. Without ArcGIS, it would be virtually impossible to calculate the complex interrelationships among the many variables, and as a result, some of the complexities of the project would have been lost. The PlaceWorks study received several awards from planning and design organizations including the American Society of Landscape Architects (ASLA) Northern California Chapter; the American Planning Association (APA) California Chapter APA Award for Outstanding Grassroots Achievement; and the Association of Environmental Planners in recognition of the unique process, thorough research, and duplicatable model. Bay Localize followed this study with a second report entitled Use Your Roof, building from the information developed in the Rooftops Study, and launched the Green Your City initiative to demonstrate how cities can meet basic needs of food, water, and energy, locally and sustainably. David Early, AICP, founding principal at PlaceWorks, has more than 25 years of experience in planning and design. He holds master’s degrees in architecture and city planning and has extensive knowledge of GIS planning concepts. He has overseen the application of GIS in a number of major projects. Sarah Sutton, ASLA, LEED AP, is a principal of landscape architecture and sustainable design at PlaceWorks. She was the principal in charge of the study, Tapping the Potential of Urban Rooftops, for Bay Localize and is currently overseeing several urban greening studies and design projects throughout California.